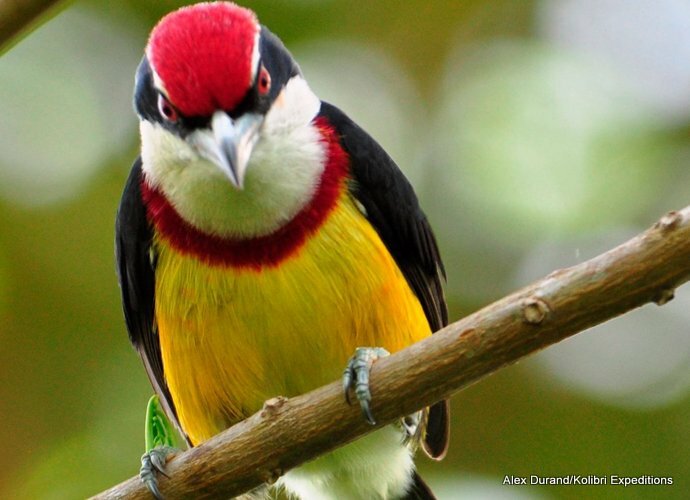 Scarlet-banded Barbet was discovered in 1995 on an isolated peak in the Cordillera Azul, the head waters of Rio Cushabatay and was formally described to science in 2000. For many years the only way to see it was doing a 10 day expedition with a 2-3 grueling hike to reach the peak. Recently a new site has been discovered very near an extremely rough but nonetheless a road allowing much easier access. This is still a rough trip with very basic accomadation and an extremely bumpy 4WD ride to get to the base, but the rewards are high with a number of other seldom seen birds in the same area. In 2017, a new species of Antbird was described from this same area - Cordillera Azul Antbird. Read more about it on BirdingBlogs.com. We shall travel to Bellavista after with stop at the dry scrub of Quebrada Upaquihua to check for birds as Huallaga Slaty Antshrike, Ashy-headed Greenlet, Planalto Hermit, Rufous Casiornis, Mishana Tyrannulet, Comb Duck, Stripe-chested Antwren and others. Night in Bellavista Hotel Monteverde. It takes about four hours by 4WD to get to the village which will serve as our base camp. On the way we shall look for Napo Sabrewing which has been seen along the road. While Scarlet-banded Barbet and Cordillera Azul Antbird are our main target many other birds which have been recorded will also be searched for as well. These include Chestnut-tipped Toucanet, Scaled, Fiery-throated and Scarlet-breasted Fruiteaters, the foothill form of Long-tailed Woodcreeper which is soon to be described as a new species. Grey-tailed Piha, Rose-fronted Parakeet, Foothill and Slaty Antwren, Rufous-breasted Antthrush. Scaled Antpitta, Foothill Schiffornis, Short-tailed Antthrush, Ash-browed and Chestnut-throated Spinetails, Yellow-throated Spadebill, Yellow-cheeked Becard, Andean Lanisoma, Roraiman Flycatcher and Jet, Yungas and Blue-rumped Manakin. Grey-mantled Wren, and many tanagers such as Blue-browed, Golden-eared and Straw-backed Tanagers. The local form of White-crowned Tapaculo also needs some attention as this complex surely includes more than one species based on the difference in the songs. At night we can search for Vermiculated Screech-Owl and Band-bellied Owl. Additional birding in the morning, until early afternoon if necessary. On the way down we’ll make stops to look for birds we may have missed. We drive to Tarapoto, where we may take a late evening flight back to Lima or stay overnight to continue to explore more of northern Peru. Price: US$ 940 (Minimum 5 people). Inlcudes hotel (but not dinner) in Tarapoto on the night prior to Day 1, guiding, camping equipment including sheets, blankets and pillows, tranport and all the food until lunch on Day 4. Note that there will be a $500 per group for hiring the 4 WD needed to get to the Barbet site. This means one person pays the full $500, and a group of two pays $250 per person etc.